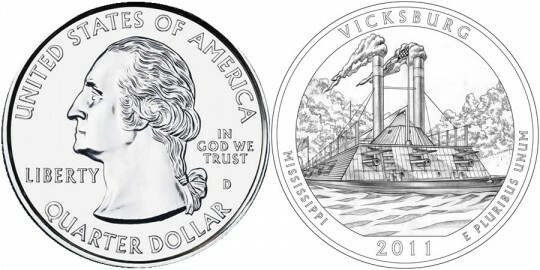 The 2011 Vicksburg Silver Uncirculated Coin will be issued by the United States Mint in 2011 as part of its America the Beautiful Five Ounce Silver Uncirculated Coin series. This specific strike honors Vicksburg National Military Park of Mississippi. These coins are struck from five ounces of .999 fine silver to a diameter of three inches just like the associated America the Beautiful Bullion Coins. In fact, the designs of both series of coins are identical and based on a third series of strikes from the Mint, the America the Beautiful Quarters® Program. All three series features reverse designs emblematic of selected sites of national interest from around the United States and its territories. Vicksburg National Military Park was established by the order of Congress on February 21, 1899 and placed under the control of the War Department. It was created to preserve and commemorate the American Civil War Battle of Vicksburg, the greater Vicksburg Campaign and those who served in both. Management of the park was transferred to the National Park Service in 1933. The inscriptions of UNITED STATES OF AMERICA, LIBERTY, IN GOD WE TRUST and QUARTER DOLLAR surround a portrait of George Washington, the first President of the United States, on the obverse of all of the America the Beautiful Coins. It was designed by John Flanagan and initially used on the 1932 circulating quarter dollar. 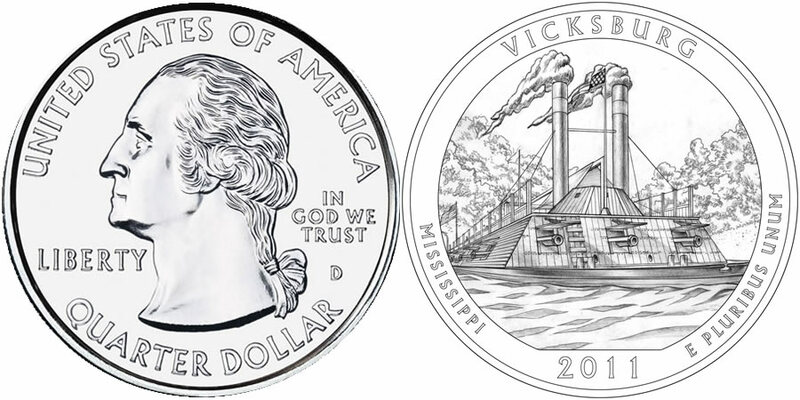 The reverse of the Vicksburg Coin shows a depiction of the American Civil War era gunboat - the USS Cairo. The Cairo was salvaged and partially reconstructed and is now on display at the Vicksburg National Military Park. Surrounding the boat are the inscriptions of VICKSBURG, MISSISSIPPI, 2011 and E PLURIBUS UNUM. It was designed by AIP Master Designer Thomas Cleveland and sculpted by United States Mint Sculptor-Engraver Joseph Menna. "999 FINE SILVER 5.0 OUNCE" is found on the edge of each strike.